RSS (Rich Site Summary) is a way of delivering dynamically changing content. RSS is used to share information on internet mostly by blogs, news sites and publishers. In a previous tutorial we discussed how to generate xml using node js. In this tutorial you are going to learn how to generate RSS feed using NodeJS and MySQL. In this tutorial you will learn to. 1. Create a database and a table for news and insert sample news data. 2. Generate an express application to generate rss feed using NodeJS. 3. Use Node orm module to fetch data from database. 4. Use feed module to generate rss feed using nodejs . 5. Use fs module to save generated rss file. To complete this tutorial you need to first install NodeJS and MySQL on your system. Visit NodeJS website to download latest version of NodeJS. After download run NodeJS installer. To install MySQL and PHPMyAdmin go to WAMP or XAMPP website. Download and install XAMPP. Run WAMP or XAMPP. Open PHPMyAdmin and Click SQL tab. Execute queries given below. Visit NodeJS website, download and install nodejs. Next install express-generator. Open command line and execute following command. Express generator is installed using NPM or Node Package Manager. NPM is used to install modules. Express generator installs Express tool. Express tool is used to generate a skeleton for NodeJS Express applications. Default templating engine is pug. You can view the generated application above. Above command changes directory to project directory and installs required modules using npm. Now after basic express app is setup. 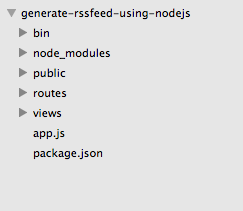 First install feed module to generate rss feed using nodejs. On command line, run following command. After feed module installation, let us install Node ORM module. Node ORM module is an object relational mapping module, that is used to manipulate databases. Open application folder in you favorite IDE like sublime text or brackets. Open index.js file in routes directory and replace all code with the code given below. First feed module is included to generate rss feed from database records. Secondly orm module is included to connect and fetch records from database. fs module is used to save generated RSS feed to a file. Open public folder and create a folder named rss. In index.js define path to save generated rss file. RSS file is saved with the name rssfeed.xml. Applcation connects to database using orm’s express method inside router.use method. Username and password with database name are passed, in second parameter in orm.express, a model is defined inside define and a function that accepts database object, models and a parameter next. Model for news database table is defined. Inside db.define tbl_news is passed. Next database table columns are mapped. Mapped columns are title as String, description as String and publish_date as Date. After connection to database and model creation, next task is to fetch data from database. Inside ‘/’ router req.models.news.find method is used to fetch data. An anonymous function is defined that receives err object and news result set. After result is returned, we loop through it to add news items to feed. Inside loop, publish_date is formatted using .toISOString method and substring 10 characters to get year, month and day. To create a feed of news items, feed.addItem method is used. A news item is passed as an object with parameters like title, link and description with author’s name, email and link to author’s profile, last parameter is date. After all news items are added to feed object, feed’s rss2 method is called. This method generates RSS feed and assigns RSS feed to a variable rssdoc. To save generated RSS feed to a file, fs module’s writeFile method is used and full path with file name and RSS document are passed. Finlay index view is rendered and a success message is displayed to user. In order to run the app, open command line and type. Now open browser and type URL given below in address bar. RSS feed is generated and saved in specified path. 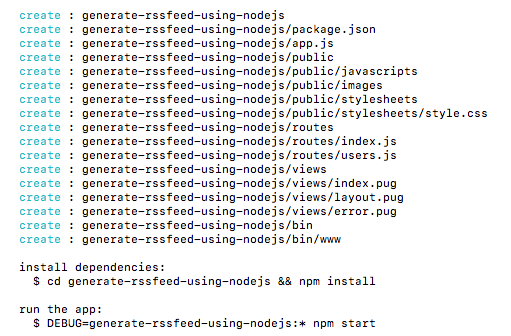 To summarize, in this tutorial you learned to generate rss feed using nodejs. Feed and orm modules are used to fetch data from database and generate RSS feed. You can clone or download example source code by using this GitHub repo link. Run npm install on command line to install all required modules before running example code. Please leave you feedback and comments. Follow us on twitter to stay informed about upcoming articles and tutorials.